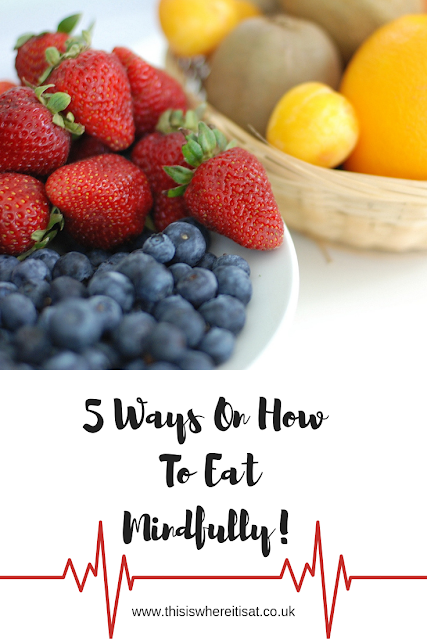 5 ways on how to eat mindfully. I have had issues with my relationship for a long time and I have slowly been working hard to have a better grip on how I respond to food. One way in which I work on is a thing called mindfulness eating. In simple terms instead of rushing my food down me, I am consciously aware of my food and taking in all the feelings and sensations I great when I eat which means it makes me feel fuller for longer and I can enjoy eating instead of it being a chore. There are many different ways to do mindful eating and I am to explore them below. I think because when I was growing up it was common practice to eat ALL your food of your plate because if you didn't it would be a waste and people seem more frugal when I was younger anyway. Even though I now know this is not a good practice to participate in. It is more important to listen to your body and stop when you feel full rather than just eating for the sake of eating. I am a binge eater though I am getting better it is working progress. A characteristic of binge eaters is eating alone, secretly and rushing the good down my gob without even thinking about it. Now, I try to eat with people or when I do have a binge do it outside with people - amazing how you don't rush around others. At the end of the day food is fuel and getting the right nutrients is key in giving you that energy to feel better. It is better to eat a variety of food then just food that is comforting and being restricted. Eating meats, vegetables and some protein is all the way forward. I am guilty of rushing about, eating on the go and just doing something else whilst eating. A good habit is to sit down, take your time and focus on just at the moment eating the food, making sure it is chewed enough and enjoying the flavours. It is a lot more enjoyable eating food this way and adapting to a slower pace. You feel better for it after and if you take the time to eat slower you reduce the risks of getting indigestion.